We were adopted by a stray cat several months ago. The kids were still in school at that time and Thadd and I were outside waiting for the bus to drop them off in the afternoon. We heard her before we saw her, the kind of friendly meow that beckons to you. She jumped up on the neighbor’s fence from the backyard, leapt down on our side and came trotting over to us. A small, gray, tiger-striped cat with just a dash of orange on her forehead. She let us pet her and then, when Addie and Jeremiah came home, we all found ourselves scrounging around for things to feed her. A bowl of milk, a piece of salami, a crust of bread (she didn’t care for that). And of course she kept coming back. I even accidentally happened to put a bag of cat food in the shopping cart soon after meeting her. Addie affectionately named her Maggie, which fit her perfectly. We continued to feed her and she stuck around. A few weeks ago Maggie started to put on quite a bit of weight around her abdomen. My suspicions were confirmed one day when she let me put my hands around her belly and I felt an ever-so-slight kick. We watched her grow so pregnant that she couldn’t walk without waddling. We put a cardboard box and a towel out on our porch, just in case, and kept on checking on her. This past Saturday morning I went outside and Maggie showed up from our front bushes very much NOTpregnant. I called the kids and we began looking for the babies, which Addie found presently. Five tiny kittens huddled together behind a sago palm in front of our house. Towards the end of the day, Maggie let us take the kittens to the box on our front porch. And there they stayed, their mama guarding and nursing them around the clock. Every chance we get, we are out there watching the miracle. The kids could stay out there for hours. Watching and petting them, picking them up, then putting them back when Maggie begins to nervously growl. The truth is, I could stay out there all day too. There is something deeply satisfying about a baby’s lustful quest for sustenance. Maggie purrs as we watch on. I have never seen her so content. At night I put the kids to bed and the boys ask for the usual bedtime story as I scratch their backs. The books we had just read together never count. They want a made-up one. And about animals. Always animals. Usually, my mind is too tired to come up with anything interesting, but tonight is different. I find myself conjuring up scenes from my past when I was a little girl. About my first cat, Blue Eyes. I tell them about how I found him when I was four and how his owner gave him to me. How he was the sweetest cat ever, even though I would fold him in half. How he had the bluest eyes. How he had gotten out of the house one day and we couldn’t find him for a while. All of a sudden I was that bright-eyed little girl with the staticky hair. “I remember being in the car on our way to the doctor, my mom driving my brother and I, when all of a sudden I heard my mom scream,” I paused and the boys sat up in bed, hanging onto every word. “There on the side of the road was a dead cat, run over by a car. My mom wouldn’t let me see it, but she was sure it was Blue Eyes. I remember how my Uncle had come and picked him up and put him in a shoebox. He let me see him then, and even then I didn’t believe that it was my cat. It didn’t look like him, but all the adults were sure about it. I remember how we had a little burial for him in the backyard. My dad, mom and I. My parents walked back inside the house, but I stood out there, sobbing. Right in front of the freshly-dug grave. I couldn’t believe this had happened. Death seemed so unnatural. I remember looking up and seeing my dad standing tall near the house looking at me. He started to walk toward me, a look of understanding on his face. I ran at him and he caught me and I wept into him-” my voice trailed off at this point as the distant memory enveloped me. A warm feeling overwhelmed and surprised me and I found myself fighting the tears. My daddy. I was overcome with feelings I had not felt in a long time. My two boys seemed fine with my ending the story at this point. Somehow they sensed the reverence of the moment. I sat there in the night thinking about my dad. His strength and kindness and protection. I kissed my boys and left the room. 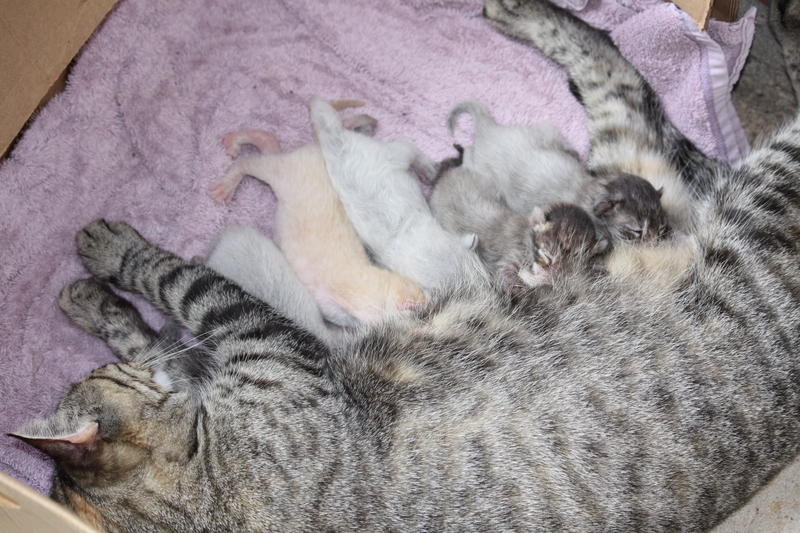 I unlocked and opened the front door and sat down by the stray cat Maggie and her babies. I ran my hand through her soft fur as she purred lazily. And I thought about my daddy.